Are you looking for a degree program that will prepare you for a high paying job? Consider getting a professional degree. A professional degree, also known as a first-professional degree, is a degree that prepares you for a particular career. The most common examples of professional degrees are law degrees (J.D.s) and medical degrees (M.D.s). However, there are many others. It is helpful to know what degree programs are out there, and which tend to lead to well-paid positions. This can help you pick a program that fits your interests and needs. The other key quality of a professional degree is that it teaches you what you need to know to perform a particular job. While you might need to conduct some academic research (such as a final capstone or paper), the program focuses on practical lessons about the profession. This often includes real-life experiences such as internships. This is different from an academic degree, such as a Doctor of Philosophy (Ph.D.), which focuses on research and other scholarly work. While academic degrees also touch on practical learning, this is not their focus. Think carefully about the job you want. Most professional degrees prepare you for one specific job. Therefore, make sure you want to follow this career path before applying and attending a professional degree program. Consider job shadowing people in the field first, or interning in the industry. This will help you decide if you want to go through the long and expensive process of getting a degree. Consider the cost. Most professional degree programs last two to four years and can be expensive. Make sure you think about the cost of the program before applying. Consider applying for financial aid if it is available. While you will hopefully be able to pay off any loans with the money earned from your first job after school, you want to make sure you don't wind up with debts you can’t pay back. Check out the reputation of the program and school. Look carefully into the reputation of any program you apply for. Ask the admissions office for information on the number of alumni hired directly out of the program. Ask what percentage of students passes the licensing exam. If possible, talk with some former students to get more information. Make sure you spend your time and money on a good program that will get you the job you want. Look into joint-degree programs. If you are applying to colleges and know what profession you want to pursue after you graduate, consider applying to a joint-degree program. Some universities offer five-year programs where students complete a bachelor’s and a professional master’s degree at the same time. This would save you time applying to a separate graduate school after college and would be quicker than a typical two-year master’s degree. However, only do this if you are quite certain of the career path you want. Below is a list of some of the professional degrees that lead to the most profitable careers. Of course, keep in mind that you should only select a degree program that fits your career interests and needs. However, this list is a useful place to start thinking of worthwhile graduate school programs. All salary information is based on data from the Bureau of Labor Statistics’ Occupational Outlook Handbook. If you want to become a doctor, you typically have to earn a Doctor of Medicine. Medical school programs last four years and include practical experience working in hospitals and doctors’ offices. People who complete medical school can earn very high salaries, ranging from $228,441 for a job in general pediatrics to $441,185 for a job in anesthesiology. People interested in medicine can also consider a Doctor of Osteopathic Medicine degree (D.O. ), which is another program for future doctors. Like medical school, dental school programs typically last four years. However, being a general dentist is a well-paid career: dentists earn an average of $158,120 per year. The number of dentist jobs is also expected to increase by 19 percent in the next ten years or so, which is much faster than the national average. A podiatrist cares for patients with foot, ankle, and lower-leg problems. They assess and diagnose problems, provide treatment, and perform foot and ankle surgeries. To become a podiatrist, you must complete a four-year Doctor of Podiatric Medicine program. Many of the courses are similar to those you would take in a Doctor of Medicine or Doctor of Osteopathic Medicine program. Podiatrists earn an average of $127,740 per year and are seeing job growth of 10 percent, which is faster than the national average. Pharmacists dispense medicine to patients and provide information on those medications. They might also conduct health screenings and provide immunizations. To become a pharmacist, you must complete a four-year professional degree in pharmacy and be licensed (which requires taking two exams.). However, there is often a big payoff: the average salary for pharmacists is $124,170 per year. Interested in becoming a lawyer? Lawyers in most states need to complete a three-year law degree, which includes coursework and real-world experience in law firms. They also have to pass a state licensing exam called a “bar exam” in order to practice in a particular state. Lawyers earn an average of $119,250 per year. You can work as a registered nurse (RN) with an associate’s or bachelor’s degree (or a diploma from a vocational training program). However, if you want to become a nurse practitioner (also known as an advanced practice registered nurse, or APRN), you need at least a Master of Science in Nursing. This is typically a two-year program that includes both practical learning and coursework. APRNs can also go on to earn a Doctor of Nursing Practice (D.N.P.) degree. No matter what degree you earn, however, you need to pass a national certification exam. Nurse practitioner jobs are growing by 31 percent - much faster than the national average. APRNs can earn an average annual salary of $110,930. An optometrist examines patients’ eyes, diagnoses and treats visual problems, and prescribes eyeglasses and lenses. Optometrists must complete a Doctor of Optometry program, which typically takes four years, and must then pass a state licensing exam. After school, optometrists can earn an average salary of $110,300 per year. They can also expect to find many job openings: the number of jobs is expected to grow by 18 percent in the next ten years. Many people in health administration, especially those who want to become managers, get a master’s degree in health administration (M.H.A.). These programs typically last two to three years and include practical administrative experience. While people with an M.H.A. go on to have a number of different jobs, a common position is health services manager. 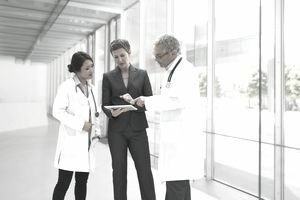 Health services managers (also known as healthcare executives or healthcare administrators) plan, coordinate, and direct medical and healthcare services. Health services managers earn an average salary of $98,350 and are expected to see 20 percent job growth over the next ten years. If you love caring for animals and want to become a veterinarian, you will have to earn a Doctor of Veterinary Medicine degree. This is a four-year program that includes time in classrooms, laboratories, and clinics. Veterinary jobs are increasing much faster than the national average, and vets can earn an average salary of $90,420. A Master of Business Administration degree is typically a two-year degree that prepares students for a variety of jobs in business. These jobs can range from a financial analyst (with an average salary of $82,450) to financial manager (with a salary of $125,080). Many jobs in business are growing at rates faster than the national average. A related degree is a Master of Public Administration, which focuses more on governance and public affairs. Students can go on to run for political office or work in private sector jobs such as management analyst (also known as a management consultant, which has an average salary of $82,450). What Is Wage Stagnation and How Does It Impact Your Income?